Dermalogica has always been an office and client favorite. 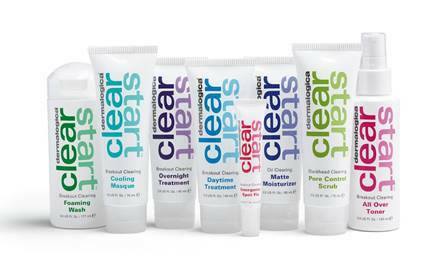 Just added to their wonderful product line is Clear Start! Utilizing a multi-step approach and potent ingredients, Clear Start can help teens reveal healthier, clear skin without irritation or dryness. We definitely wish we had this line around when we were younger and going through embarrassing breakouts! Start off the school year with confidence and clear skin! Select the right cleanser and moisturizer for your skin concerns, add your toner and special treatments and you’re all set. With the power of Salicylic Acid and Tea Tree, clear breakouts and dead skin cells on the face and body with the Breakout Clearing Foaming Wash. If you suffer more from blackheads, cleanse with the Blackhead Clearing Pore Control Scrub. It exfoliates and clears up excess oil with Bentonite and Kaolin clays. Control excess oil, balance and soothe skin, and get rid of breakouts on the face and body with the convenient spray formula of Breakout Clearing All Over Toner. If you experience breakouts – use Breakout Clearing Daytime Treatment, utilizing Benzoyl Peroxide and Niacinamide to break up bacteria and purify pores. If your concern is oily skin – go with Oil Clearing Matte Moisturizer SPF 15. With special oil-absorbers, soak up excess oil, maintain clear skin and protect against sun damage. At the first sign of a breakout, use Breakout Clearing Emergency Spot Fix. Benzoyl Peroxide deeply penetrates pores to clear breakouts fast! You can apply every 6-8 hours as needed until the blemish clears. If you’re suffering from redness and irritation, soothe skin with the Breakout Clearing Cooling Masque. The potent combination of Salicylic Acid, Camphor and Licorice Extract will soothe, cool and purify skin. To fight breakouts while you sleep, use the Breakout Clearing Overnight Treatment. It absorbs quickly to soothe and clear up breakouts while controlling oil. If you have any questions about teen acne or any other skin concerns, let us know and we can recommend products just for you! Nice review. Acne loves the night time. Which is why I try to watch what my skin is exposed to throughout the day. I have heard about this product but did not hear if anyone had solid results. I try to look for products that contain Salicylic Acid and other ingredients that have been proven to help my acne. Very informative blog post.Really looking forward to read more. Keep writing.. While some people are blessed with a clear and radiant skin others might have to work towards it.